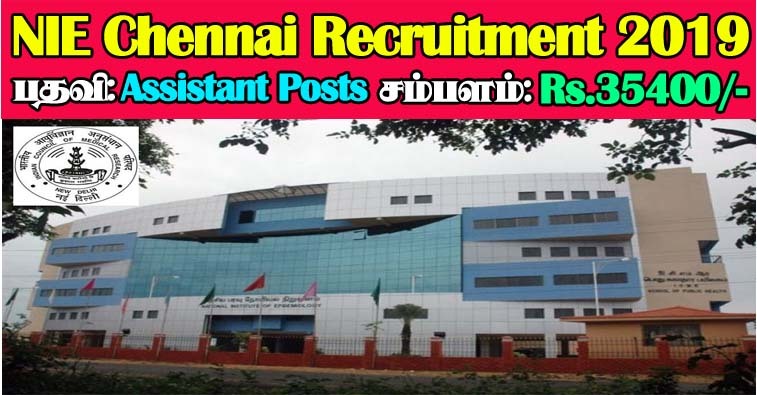 NIE Chennai Recruitment 2019 - NIE Chennai invites applications for recruitment of 02 Assistant Posts. The applicants are requested to Download Application Form through Official Website www.nie.gov.in. The last date for the receipt of application along with enclosures is 11.02.2019. Interested candidates are requested to peruse the advertisement regarding the process of Examinations and Interview, Eligibility Criteria, Application Fee, How to Apply, Pattern of Examination, Syllabus, Question Paper, Admit Date, Exam Date, Result Date etc,. Refer thoroughly before applying. NIE Chennai may follow the following process to select the candidates. .The candidate has to remit application fee of Rs.300/- (Rupees Three Hundred only) (wherever applicable) through Demand Draft from a nationalized bank in favour of “The Director, National Institute of Epidemiology” payable at Chennai. 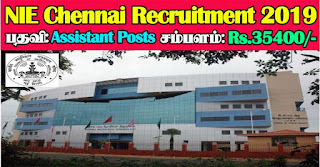 How to apply NIE Chennai Assistant Recruitment 2018? Application form may be downloaded from the websites www.icmr.nic.in, www.nie.gov.in and submitted along with supporting certificates and testimonials duly attested by self and addressed to The Director, ICMR-National Institute of Epidemiology, 2nd Main Road Tamil Nadu Housing Board, Ayapakkam, Chennai – 600 077, duly superscribed as “Application for the post of Assistant” on the top of envelope so as to reach on or before the closing date.